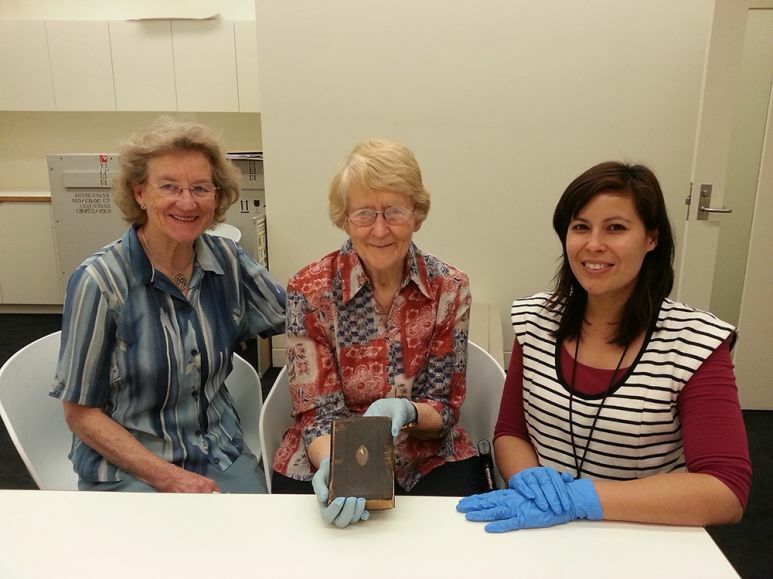 Helen Woolcock, Mary Watson’s step-great-niece, came to look at objects held in Queensland Museum’s collection relating to the Lizard Island story. Helen’s visit to the museum was one part of a bigger journey to revisit her family story. Helen was excited about seeing a bible in the collection that belonged to Mary Watson. While personally inspecting it she was thrilled when a written message to Mary from a ‘young friend’ was revealed on the first page. 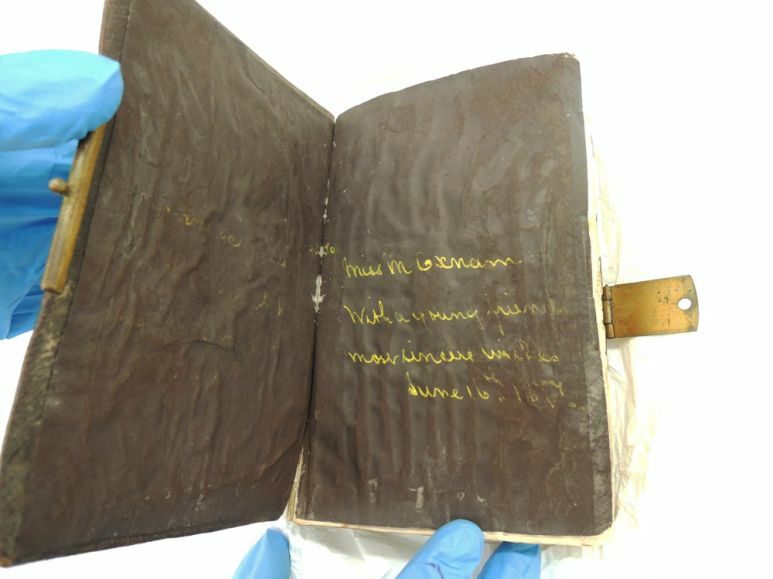 You can view Mary Watson’s bible by searching Queensland Museum’s Collections Online. 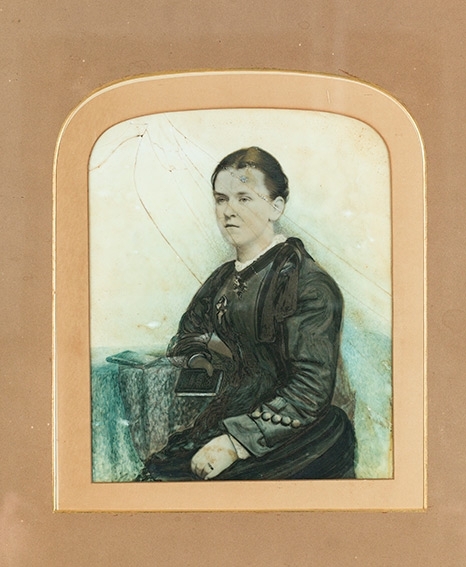 Glass painted portrait of Mary Watson (artist and date unknown), also held in Queensland Museum’s Collection. According to Helen, family members in North Queensland sent the portrait and bible down inside a trunk to Helen’s father in Brisbane during the Second World War for safe keeping. The items were then donated to the museum by Helen’s father in 1946. The famous iron beche-de-mer tank and paddles that Mary Watson used to escape Lizard Island were some of the other objects Helen looked at on her visit. While looking at them, Helen told me how her father used to take her to the old Museum at Bowen Hills each year at Christmas when she was a child. She described the visits as a sort of family pilgrimage to see these objects which were always on display and to remember their great ancestor’s story. It is a privilege to talk with visitors when they are looking at objects in the collection, especially when they have a personal connection to them. Providing public access to the museum’s collection is an important part of my job as a curator and giving people the opportunity to see, remember and learn through objects is a way of building on what we already know about Queensland’s past. You can see the tank and paddles on display now in the Discover Queensland exhibition on Level 2.